1Department of Microbiology, Faculty of Science, University of Port Harcourt, East-West Road, P. M. B. 5323, Choba, 500004 Port Harcourt, Nigeria. 2Department of Science Laboratory Technology, School of Science and Technology, Port Harcourt Polytechnic, Rumuola, P. M. B. 5936, Port Harcourt, Nigeria. *To whom correspondence should be addressed. E-mail: sololeera@yahoo.com, jason.ogugbue@uniport.edu.ng. Received 12 March, 2016; Received in revised form 30 March, 2017; Accepted 30 March, 2017. Contaminated soil, Ex situ bioremediation, Brewery spent grain, Rabbit droppings, Biostimulation efficacy. 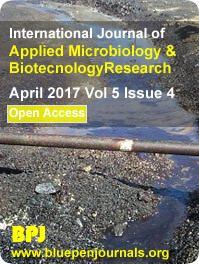 Brewery spent grain (BSG) and rabbit droppings (RD) were investigated to determine their potentials as biostimulation agents for enhanced ex situ bioremediation of an aged crude oil contaminated soil (COCS). Samples were collected from a fresh oil spill site and 300 g of soil was amended with 150 g each of RD and BSG. The control (CT) contained 300 g of COCS without amendment. Monitoring of various physico-chemical parameters including total petroleum hydrocarbon (TPH) content of COCS was done for 5 weeks at 7-days intervals. Hydrocarbon utilizing bacterial isolates identified include Corynebacterium, Staphylococcus, Pseudomonas, Bacillus and Flavobacterium genera. In RD amended treatment, the total heterotrophic bacterial/hydrocarbon-utilizing bacterial (THB/HUB) and the total heterotrophic fungal/hydrocarbon-utilizing fungal (THF/HUF) ratios were 2.45 and 2.32 respectively, as against 1.46 and 1.23 obtained for BSG. The ratios in the control were 0.75 (THB/HUB) and 0.94 (THF/HUF) thus, indicating growth stimulation of hydrocarbon degrading microorganisms as a result of the amendments. The TPH content of COCS amended with RD and BSG decreased by 57.9 and 39.6%, respectively whereas, the CT reduced by only 0.59%. There was a significant (p<0.05) reduction in TPH after 35 days. The order of biostimulation efficacy (RD < BSG) showed that RD enhanced the removal of TPH from soil during remediation better than BSG. Data from this study indicate the biotechnological potentials of these waste materials for remediation of COCS by enhanced natural attenuation.